Original Pub. Date: Feb. 8, 2016. Last Update: Feb. 18, 2018. Westerners are not only known as history ignoramuses, but double dumbass history ignoramuses when it comes to cosmetics and cosmetics history. Since I'm the one-and-only Historyscoper (tm), let me quickly bring you up to speed before you dive into my Master Historyscope. In 1,351 B.C.E. 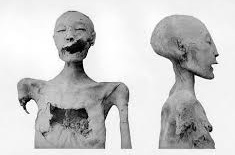 Amenhotep III dies (from complications caused by abscesses in his teeth? ), and his son (co-regent since -1353) Amenhotep (Amenophis) ("Amun is satisfied") IV (-1384 to -1334) (later Akhenaten) becomes king #10 of the 18th Egyptian Dynasty at Thebes; his sister-wife is luscious eye liner-wearing ruby-red-lipped "Lady of the Two Lands" Nefertiti (Ankhkheperure Neferneferuaten) (-1370 to -1330) ("Nefer" = beautiful, "Titi" = er, arrived), daughter of the equally luscious Queen Tiy; they have six daughters, incl. the three "senior princesses" Meritaten (Merytaten) (Meryetaten) (-1350 to ?) ("beloved of Aten"), who marries her brother Smenkhkare, Meketaten (-1349 to ?) 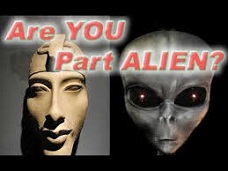 ("protected by Aten"), and Ankhesenpaaten (Ankhesenamen) (-1348 to -1323), who marries King Tutankhamun, and whose statue is discovered in the 1930s by English archeologist Mary Chubb (1903-2003); Akhenaten, Nefertiti, and Tut have elongated skulls, spawning theories that they are part alien. 10-10-1562, Queen Liz Is Almost Through? On Oct. 10, 1562 English queen (since Nov. 17, 1558) Elizabeth I (1533-1603) falls sick with the smallpox at Hampton Court, and remains bedridden for six days, going into a coma for 24 hours on Oct. 16 and having a close brush with death which scares her subjects into a realization that there is no clear Protestant successor; on Oct. 17 physician Dr. Burcot (at the point of a dagger?) tries an old Arab cure recommended by English medieval physician John of Gaddesden, giving her a potion, wrapping her in red flannel and laying her on a pallet beside a fire, causing her to regain consciousness in two hours; on Oct. 17 she orders the councillors to appoint Robert Dudley as lord protector of England, with a salary of £20K a year, plus a £500 a year pension to his valet Tamworth, causing whispers that she is buying his silence for guarding them both when they are alone, causing her to protest that "although she loved... Lord Robert dearly, as God was her witness, nothing unseemly had ever passed between them"; she returns to her duties on Oct. 25, and only shows pox marks on her hands, although she goes bald and begins wearing wigs, starting a fashion vogue in Europe which lasts for cents. ; meanwhile she gets into that lead and antimony-based white paint stuff for her face (to cover the officially nonexistent pox marks? ), creating "the Mask of Youth", and probably neuters herself, how convenient for the Virgin Queen AKA the 16th cent. Madonna Like A Virgin; too bad, she starts a trend for women to covet pale skin, causing them to bleed themselves; meanwhile her councilors never intended to appoint Dudley? ; Robert Dudley's sister Mary Dudley (mother of newborn brain babe Mary Dudley Sidney, a future candidate for the real Shakespeare) nurses Elizabeth I through the smallpox and gets it herself, becoming severely disfigured. In 1902 4'10" Krakow-born Jew Helena (Chaja) Rubenstein (1872-1965) emigrates from Poland to Australia, finding herself in a wonderland of 75M merino sheep, from which she obtains lanolin to make her Creme Valaze beauty cream, becoming a success and moving to London, England in 1908 with $100K, then to Paris, France in 1912, where she opens a salon, then to New York City in 1914, where she opens another salon, becoming rivals with Elizabeth Arden; in 1928 she sells-out to the Lehman Brothers for $7.3M, then after the Great Depression arrives she buys it back for less than $1M, expanding to a dozen U.S. cities. In 1904 Ajaccio, Corsica-born Francois Coty (Joseph Marie Francois Spoturno) (1874-1934) founds a perfume co. in Paris, France, making slow headway until he spills a bottle of his La Rose Jacqueminot on a countertop at the Grands Magasins du Louvre dept. store, causing a customer frenzy that makes him into a player in the perfume world, becoming the first to sell products in attractive bottles; in 1908 he relocates his HQ to Suresnes near Paris, founding La Cite des Parfums, growing to 9K employees producing 100K bottles/day; in 1921 he expands to New York City, amassing a fortune of $34M by 1929; in 1922 he purchases the conservative Parisian newspaper Le Figaro and renames it Figaro, turning far-right and anti-semitic; in 1963 Coty Inc. is acquired by Pfizer, which switches to drugstore distribution; in 1922 they sell Coty to Joh. A. Benckiser GmbH of Germany. 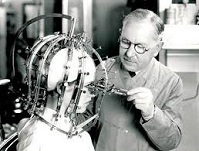 In 1907 Paris-born French chemist Eugene Paul Louis Schueller (1881-1957) invents a new synthetic hair dye which he calls Aureale, founding L'Oreal (originally Societe Francaise de Teintures Inoffensives pour Cheveux), which grows into a cosmetics giant, the world's largest; in 1936 he invents sunscreen. In 1909 Polish Jewish immigrant Max Factor Sr. (Maksymilian Faktorowicz (1872-1938) begins making theatrical makeup and wigs for the film industry in Los Angeles, Calif., making fans of Mary Pickford, Gloria Swanson, Pola Negri, Bette Davis, Norma Shearer, Joan Crawford, Judy Garland, Claudette Colbert et al. ; in 1920 he permits his products to be called makeup instead of cosmetics. In 1912 after founding the Red Door Salon in New York City in 1910, Woodbridge, Ont., Canada-born Elizabeth Arden (Florence Nightingale Graham) (1878-1966) travels to Paris to study at beauty salons, returning with a collection of rouges and tinted powders and introducing modern eye makeup to North Am., going on to found salons worldwide beginning in 1915 (150 by 1929) and create the idea of the "Total Look" and "makeover", fighting rival Helena Rubenstein to become #1 by the 1930s, with celeb clients incl. Marlene Dietrich, Joan Crawford, Wallis Simpson, and later Marilyn Monroe and Jackie Kennedy. On May 5 (5-5), 1921 French fashion designer Gabrielle Bonheur "Coco" Chanel (1883-1971) starts selling Chanel No. 5, combining the scent of flowers (like respectable women wear) with animal musk and jasmine (worn by hos), discovered by accident by an asst. of Russian-French perfume chemist Ernest Beaux (1881-1961), who claims it reminds him of a fragrance he smelled inside the Arctic Circle, "where the rivers and lakes release a note of incredible freshness"; in 1923 Coco develops a tan on a yachting trip, starting a fad. In 1932 Revlon Corp. (originally Revlon Nail Enamel Co.) is founded in New York City with $300 in capital by cosmetics distributor Charles Haskell Revson (1906-75) and chemist Charles Lachman (hence the "l" in the name) to market a new type of nail enamel using pigments instead of dyes, expanding to dept. and drug stores in 1937, becoming a multimillion-dollar biz in 6 years, offering a complete manicure line incl. lipstick by 1940, then acquiring Graef & Schmidt cultery co. in 1943 to begin producing manicure and pedicure instruments. In 1946 Queens, N.Y.-born Estee (Estée) Lauder (Josephine Esther Mentzer) (1906-2004), daughter of Hungarian Jewish immigrants begins a cosmetic biz with skin creams invented by her chemist uncle John Schotz of New Way Labs, incl. Super Rich All-Purpose Cream, Six-In-One Cold Cream, and Dr. Schotz's Viennese Cream, creating her first fragrance Youth Dew in 1953, marketed as a bath oil to make them buy more, selling 50K bottles the first year, growing to 150M by 1984.